Just in time for Easter, The Brick Testament takes on The Apocalypse of St. John the Apostle, or Revelation for short. I’m always excited to see a new entry in this great work. Is it just me or does the ‘powerful angel’ look like Chuck Norris? A Johnny Cash song comes to mind. 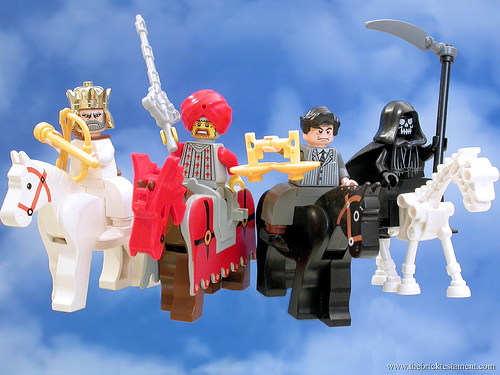 Slightly reminiscent of how I picture Terry Pratchett’s horsemen from the Death series within Discworld. Love to see more of the creative application of LEGO in Brick Testatment from their retelling of stories to their interpretation of laws and epistles.